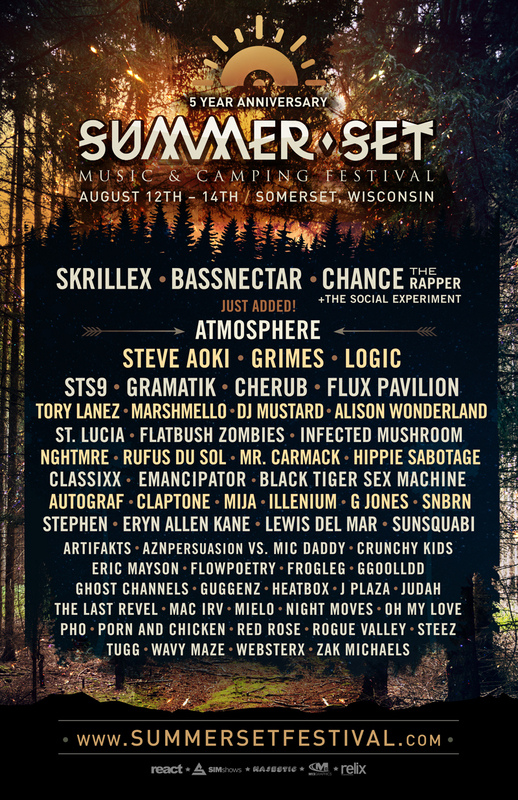 Summer Set Music & Camping Festival (SSMF) is extremely proud to announce a very special expansion to the festival's already stacked lineup with another highly sought-after addition.For the very first time, Minneapolis’s most acclaimed hip hop act ATMOSPHERE will be joining the Summer Set family for a highly anticipated performance. Summer Set attendees are in for a treat, as this is the first time the duo will perform their forthcoming album live! Boasting nearly two decades worth of incredible, underground releases, Top 20-charting albums and a veritable movement within the hip hop scene and beyond, the combination of Atmosphere's own creations and their Rhymesayers label has unceasingly pushed the genre into exciting new avenues. Over the years, their success and global influence have also established their home town of Minneapolis as a mecca of indie rap and underground productions. With the addition of the group’s powerful yet intimate approach to the style, Summer Set fans can look forward to the most exciting and well-rounded installment of the festival to date!